Can the Runner avoid the tag from God of War and still get the virus counters? No, taking the tag is a cost to placing the virus counters on God of War. If the tag is avoided, the cost hasn't been paid and the counters do not get placed. There are two ways to look at God of War: as an AI icebreaker and as a tag engine. As an AI it's not great: each turn you get two subroutine break (virus) counters, which accumulate but are vulnerable to corp purging and things like Cyberdex Virus Suite and Macrophage. To actually use those counters you need to boost strength at 2 per +1. Not great. Of course AI's aren't supposed to be very economical. The other side of God of War is that it can generate tags, one per turn. Now normally that's a bad thing, BOOM! being a thing and all. But the clans of Mars seem to like having their contact details known to every megacorp in the solar system. Just look at Jarogniew Mercs and Counter Surveillance. Those cards use tags as fuel for quite good effects (meat damage prevention and multi-access). And another Mars-clan themed card - Mars for Martians - gives credits for tags. Oh, and it gives free draw for clan resources. 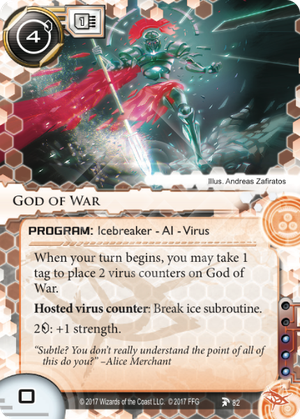 God of War has a slight downside that it takes up a memory slot even though you'll rarely use it to break ice but on the bright side it's immune to resource trashing and because it's also a virus card it works with the usual anarch virus support systems (e.g. Djinn. MemStrips, Progenitor).